A140 Amino - MPEG-2 and H.264 (MPEG-4) HD/SD IPTV set-top box (STB) | AdvancedDigital Inc. The Amino A140 – the next generation MPEG-2 and MPEG-4 high definition IPTV/OTT set-top-box (STB) for HD deployments. High definition capability and OTT functionality are becoming must have features in new IPTV deployments worldwide. The Amino A140 is a cost-effective HD STB that provides the perfect balance between price, specification and high performance. Stylish and compact, the AminoA140 now enables IPTV providers to deliver a compelling mix of broadcast, on-demand and OTT services with new features including HTTP live streaming (HLS) and HTML5 technologies. The A140 is complemented by an extensive range of set-top-box middleware, browsers, conditional access and DRM options. All STB functions can be controlled from a browser using the Amino JMACX system. HDMI 1.3a. (excl. Deep colour and DTS audio) with HDCP. S/PDIF (optical). USB2.0. 10-way Mini-DIN for Composite video, Component (YPrPb),RGB, S-Video and analogue audio. RF Mod and loop through. Wide selection of DRM and Conditional Access support. 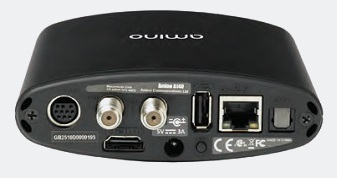 HDCP on HDMI. Macrovision (optional).